Millennial slang is perking up politics. Here's what aggro and troll mean . . . :: Grammar, style, and proofreading quizzes use sentences from literature. Millennial slang is perking up politics. Here's what aggro and troll mean . . .
AGGRO. It means a combination of aggravate, angry and aggressive. What do reporters mean when they say Trump or Cruz went aggro or aggroed one another? In MMORPG (massively-multiplayer online role-playing games like World of Warcraft) aggro refers to mobs, monsters or characters who attack you on sight without provocation. Using aggro as a tactic to draw out an opponent or put an opponent on defense is no school yard bully’s trick. In game theory there are algorithms that determine who the mob, monster or character is going to attack and predict if the mob will bring friends to join in the attack. Trump and Cruz are not using algorithms for stump speeches. They are natural politicians, but millennials observing them are reminded of video games where aggro happens all the time. TROLL. Troll has nothing to do with fishing, Norse mythology or those cute little dolls from the 60s with the colored hair. In Millennial slang, troll refers to someone who uses an internet post to start an argument. Those mean people who leave hateful, crude remarks in the Comments section of a website don’t count as trolls. A troll is far more provocative, clever and sophisticated. 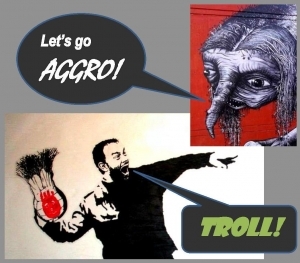 Here’s where aggro and troll intersect. A troll posts a statement or observation online or via Twitter, Instagram or other social media with the intent of getting a rise out of someone and forcing them to respond. A troll’s goal is to upset someone to the point that they go aggro. When a commentator accuses Trump of trolling or being a troll, it’s a compliment in the world of political science.